On one of our recent brunch outings, we went to Maialino, where I finally had one of their signature olive oil muffins (it was as good as I expected and it inspired me to bake up a batch back home a few days later). Before going to the restaurant, I looked online at their menu and spotted something really interesting: "chestnut croissant". I was so excited because (1) I love all things chestnut (just type in "chestnut" in my search function on the right-hand side of the page to see what I mean) and (2) I'd never had such a thing, and really wanted to! But when I next looked back at the menu, the chestnut croissant had disappeared. It sounds crazy but I almost feel like I imagined it! Well...there was only one thing to do since I've never seen chestnut croissant anywhere and that was to make it myself at home. Sometimes an idea gets in my head and I just have to give it a go and this was one of those things. So I took inspiration from when I last made almond croissants and did a pretty simple version of chestnut croissant for breakfast this weekend. It really helps if you have a stash of chestnut cream in your house like I do (otherwise, you can source it online). 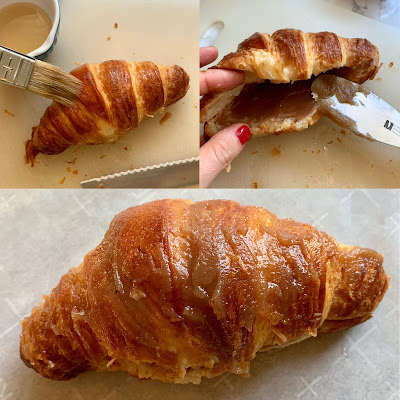 To have your own chestnut croissant, all you have to do is take day-old croissants, split it, and soak it in a rum sugar syrup. Then spread some chestnut cream/spread inside, and brush a little on the surface for fun. Bake for about 15 minutes and you have it! It's really easy since you're mainly working with store-bought ingredients, but with a little twist, you end up with something really special. I'm here to say chestnut croissant is a really, really good thing! As I mentioned, I made the chestnut croissants much the way I learned how almond croissants are done. With the chestnut cream in hand, making chestnut croissants is even easier than making almond ones since you already have the filling and there's no need to make it yourself the way you make the almond cream. Needless to say, start with good-quality croissants. The day before, leave them out (uncovered or very loosely covered) overnight so they have a chance to dry out. This way, they can better absorb the sugar syrup that you'll apply onto them. Add a little rum to the sugar syrup (just water and a little sugar) or if you want to skip the alcohol, add a touch of vanilla extract. Slice the croissant like you would if you were making a sandwich but don't slice all the way through. Brush the syrup all over the croissant, including the top, inside, ends, and all. While it shouldn't be dripping wet, it should be well moistened. Next, spread about 2 tablespoons of chestnut cream into the middle. I thought I'd also spread a little bit of chestnut cream on top of the croissants to mimic what you see with almond croissants. It worked out quite well; the chestnut cream dries out and caramelizes slightly after baking, giving the croissant an extra layer of texture and chestnut flavor. Bake the assembled croissants in a 350 degree oven for 15 minutes. Remove them to a wire rack to cool a bit, then serve! Dust the top with a little confectioners' sugar, if you like. It's no doubt that I love all things chestnut but I was almost surprised by just how much I liked my chestnut croissants! The chestnut cream adds a great dimension of flavor to the buttery pastry - not too much sweetness but a little nutty sweetness that is unique and so lovely for us chestnut lovers! I am really glad I couldn't let my chestnut croissant daydream go without making it a reality. This is something I would definitely make again! Prepare syrup by heating water in the microwave until hot. Stir in sugar until melted. Set aside to cool, then stir in rum (or vanilla extract). If making ahead, refrigerate until needed. Using a serrated knife, slice each croissant open horizontally like you would to make a sandwich but don't slice all the way through. One at a time, brush each croissant generously with the sweetened syrup. Coat the outside, inside, and ends. While they shouldn't be dripping wet, the croissants should be well moistened. Spread approximately 2 tablespoons of chestnut cream inside each croissant. Also brush the top of each croissant with a little chestnut cream. Place onto the prepared baking sheet and bake for about 15 minutes, when the chestnut cream on top has firmed and the croissant is set and golden. Remove from the oven, let cool on a wire rack, and dust with confectioners' sugar before serving warm or at room temperature. wow Why didn't I think of this? It looks so very good with chestnut cream!